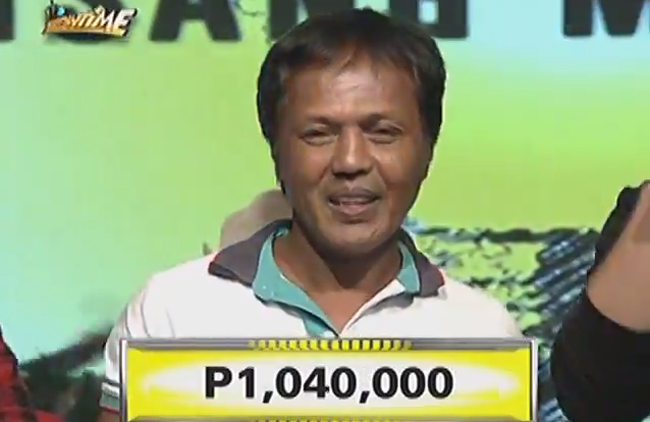 An ice cream vendor in Luneta Park is the very first contestant who scooped the one million jackpot prize in It’s Showtime’s newest segment ‘Isang Tanong, Isang Milyon’on November 19, 2014. Mang Roberto had been earning 300 each day as an ice cream vendor for 40 years. As a father of five children, he had been aiming to give his children quality education and a better future. After he uncovered the hidden words in the question he was about to answer, the It’s Showtime hosts asked Mang Roberto about his plans if ever he will get the million. Having 40 thousand pesos from the previous rounds in the game, the nervous contestant answered that though 40 thousand might not be enough, he will gradually pay his debts to his relatives. Mang Roberto also plans to pay his overdue bills in Meralco and pay for his mother’s medical expenses who has diabetes. Vice Ganda shared that his plans are good and he should also spend it wisely. The missing words that he uncovered were, Antarctica,’ sa’, and ‘planeta’. The whole sentence stated ‘Ang kontenenteng Antarctica ay sa anong planeta makikita?’, to which his five children had answered ‘Earth’. Mang Roberto went home with a total cash prize of Php1,040,00. He promised to pay all hi debts in full and in cash, including his Meralco bills and his children’s school expenses. The audience had cheered for him as he unbelievingly claims the jackpot prize.